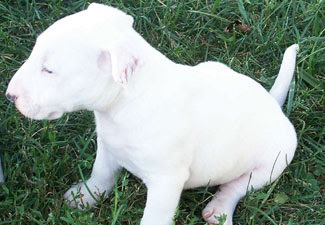 Weight: 6-8kgs Height: 30-32 cms Color(s): white variety: white, with markings on head permissible; colored variety: any color other than white, or any color with white markings; brindle prefer Coat: The coat of the Bull Terrier should always be short, flat and harsh, even being somewhat coarse to the touch. Distinct Feature: The Bull Terrier is a lively breed but can also be lazy and quiet at times. A very muscular and well-built breed, this dog has a very sweet disposition and can be very affectionate.. Temperament: Fiery, energetic, and loving, this breed can also be protective of his owner and his territory, giving off somewhat of a fearless presence. This breed makes a good watch and/or guard dog. The Bull Terrier is very hardy and sturdy and can tolerate quite a bit of child's play, however should always be supervised, as Bull Terriers can be snippy if they are overly pestered. With proper socialization and training, this breed can do well with other dogs Activity: The Bull Terrier is a very lively breed. A ball of fire, this dog requires quite a bit of exercise to stay healthy and active. At least a medium sized yard would work best as this breed has almost infinite energy. This breed requires long daily walks, twice a day is best, as they can become destructive if not given the proper stimulation and exercise requirements.Large Dog Breed Bull Mastiff .. English Mastiff ..French Mastiff.. Neopolitan Mastiff ..Great Dane.. St.BernardMedium Dog BreedAustralian Sheperd ..Beauceron..Belgium Shepherd.. Boxer..Chow Chow..Dalmatian..Dobermann.. German Shepherd..Golden Retriever..Grey Hound..Irish Setter..Labrador Retriever.. New foundland..Pointer.. Rajyapalam..Rottweiler.. Rough Coolie..Siberian Husky..SMALL DOG BREED Basset Hound..Beagle.. Bichon Fries..Bull Dog – English ..FrenchBull Terrier.. Chihuahua..Cocker Spaniel..Dachshund..Jack RusselTerrier..Lhasa Apso..Maltese.. Miniature Pinscher.. Pekingese..Pit Bullterrier..Pomeranian..Poodle..Pug..Samoyed..Scottish Terrier..Shih-Tzu..Tibetan Spaniel..Yorkshire Terrier..